The theme of this year’s celebration is “Sit Down for Breakfast, Stand Up for Farmers” and to mark the occasion members of the University’s Fairtrade group will be tucking into a breakfast at Gorad restaurant. The breakfast will include Fairtrade staples such as tea, coffee and bananas. “Breakfast is the most important meal of the day yet millions of farmers working in developing countries don’t earn enough to know where their next meal is coming from. The University’s food and drink outlets are absolutely committed to this campaign and each year we increase the number of Fairtrade products that we use” said Angela Church, Head of Catering and Conferencing. 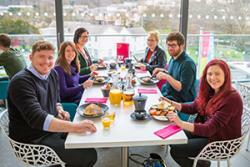 Aled Closs Davies, Gorad Restaurant Manager; Mair Rowlands, Sustainablity Lab; Lydia Richardson, SU VP Education & Welfare; Ffion Jones, SU; Mark Stanley, SU VP Societies & Communities & Fflur Elin, President, Bangor SU enjoy a Fairtrade breakfast.The University, which has had Fairtrade status since 2009, has once again joined forces with the Bangor City Fairtrade Group and Campus Life to celebrate the fortnight. This year’s events include a Fairtrade Fayre, St David’s day quiz, a bake off competition, Karaoke and Fairtrade cocktails at Bar Uno and a love your clothing event at the Deiniol Centre, Bangor. Throughout the fortnight Fairtrade breakfasts will be served at Gorad restaurant and delicious Fairtrade chocolate and banana muffins will be sold across the University’s eating outlets. The University’s Fairtrade group comprises of representatives from the Commercial Services Department, the Sustainability Lab, Campus Life and the Student Union. For full details of the all the University’s Fairtrade events visit the website.